The deadlift is often considered an exercise that targets your hamstrings, glutes, lower back and core muscles, but it is also great for hitting your forearms, traps, rhomboids and lat muscles. While it's not possible to make the deadlift into a lat-dominant movement, there are ways you can use your lats more when you pull, and you may also find that improving your lat strength can help increase the weight you use on your deadlifts. Your lats are the wing-shaped muscles at the side of your back. They attach on the front of your upper arm, run under your armpit, all the way down your side and insert below your lower back, around the pelvic girdle. The main role of the lats is to pull your arm in toward your body and stabilize your torso when doing upper body exercises. There is a small amount of arm movement during a deadlift, but the lats' main role is to stabilize as you pull. As your lats work to keep your arms close to your body and stabilize them, it's best to perform deadlifts in this way. 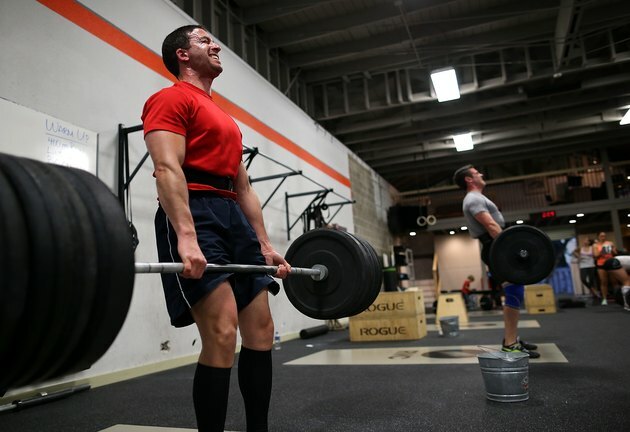 Eric Cressey, strength coach and author of "Maximum Strength," recommends keeping the bar as close as you can to your body at all times during a deadlift. Your lats are a large muscle group and are capable of handling heavy loads, so this shouldn't be an issue for you. If, however, you do find this difficult, then you may have a weakness in your lats, which you need to address with other exercises. If you're finding that the bar is traveling away from your body during the lift, then your lats may not be weak -- you may just not be using them properly. Jim Smith, owner of Diesel Crew Strength and Conditioning, recommends that before you pull your deadlift, you think about keeping your whole upper back as tense and strong as possible, and make sure that you keep that tension throughout the whole lift. If you don't maintain the tension, it's likely that when you lift near-maximal weights, you will struggle to get the bar off the floor. You should include lat training in your program, but it becomes especially important if weak lats are holding back your deadlifts. There are two main types of lat movement -- vertical and horizontal -- and you should do one of each type when you train your lats. For your vertical exercise, choose either chin-ups, pull ups or pull downs, and do five sets of six to eight reps. For your horizontal exercise, pick a rowing exercise, using either a barbell, dumbbell, fixed weight machine or cable machine. Do four sets of 12 to 15 reps.